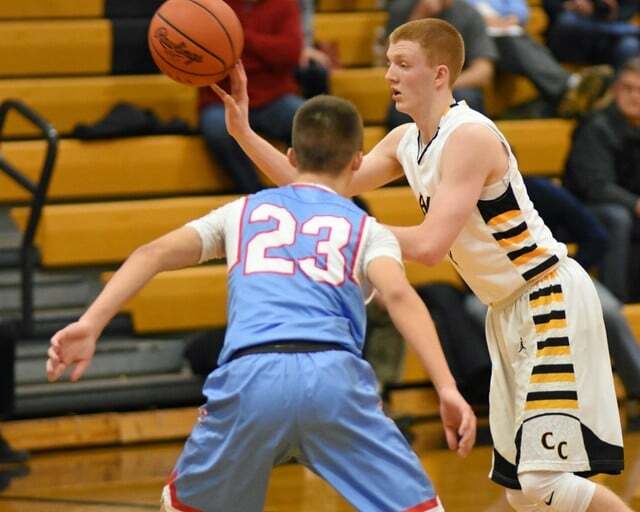 SANDUSKY — Colonel Crawford advanced to the Division IV district basketball tournament with a 59-50 win over Lucas on Friday. Up next for the Eagles is No. 3- seeded Norwalk St. Paul, a 53-45 winner vs. Buckeye Central in their sectional title game. The district semifinal is Tuesday, March 7 at 6:15 p.m. at Willard High School. Tickets will be on sale in the Colonel Crawford High School office during school hours on Monday and on Tuesday until noon. Tickets are $6 for adults and $4 for students. All tickets at the door are $6, Colonel Crawford receives a portion of early ticket sales. The Eagles started strong Friday night at Sandusky High School, outscoring the Cobs 20-8 in the first quarter, and then withstood a late Lucas charge for the win. Crawford led 32-18 at the half and 43-29 to start the fourth. Lucas outscored Crawford 21-16 in the last period but couldn’t pick up the win. It is the Eagles’ sixth-straight sectional championship and seventh in the past eight years. Colonel Crawford was led by freshman point guard Cameron McCreary with 19 points to go along with six assists and two rebounds. Gavin Feichtner was the only other Eagles’ player in double figures, scoring 11 points while grabbing three rebounds and dishing two assists. Heath Starkey contributed eight points on the night and grabbed seven rebounds, blocked three shots and recorded a steal. Jordan Fenner added seven points, four assists and two steals. Harley Shau had six points, five rebounds and two assists. Brody Martin chipped in five points, Hayden Bute had two and Reis Walker finished up the Crawford scoring with a point. Eagles’ stat line: 13/25 (52%) from two-point range, 7/11 (64%) from three and 12/21 (57%) from the charity stripe; 24 total team rebounds, 14 assists, four steals, three blocks and 14 turnovers. Josh Murphy and Jeb Grover both scored 14 points for the Cubs in the loss. Dylan Dennison also finished in double figures with a dozen points. Jacob Miller added six points, Jackson Hanger had three points and Wyatt Alt rounded out the Lucas scoring with a point. Cubs’ stat line: 9/18 (50%) from the interior, 8/26 (31%) from the perimeter and 8/19 (39%) free-throw shooting; 24 team rebounds and just eight turnovers.